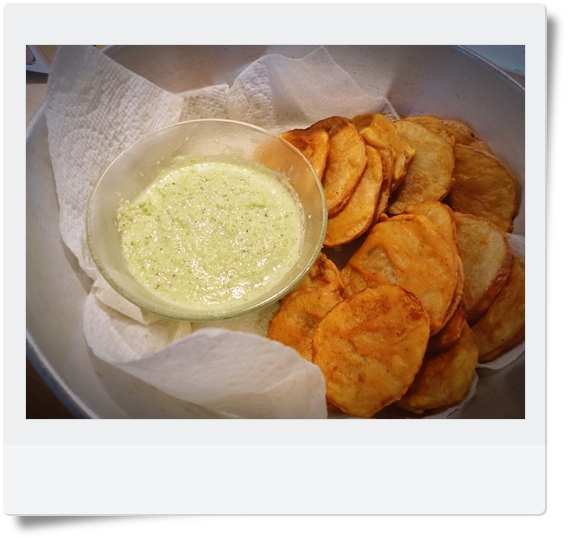 Originating from Indian these crispy potato slices are popular amongst East African Asians. Often made in the Mnyusiwalla household, they are a famed speciality of my dad’s and they go perfectly with green coconut chutney! 1.Add water to the flour slowly until it is the consistency of pancake batter. 2. Add the spices and and mix well. 3. When the oil is ready for frying, add the baking powder to the batter and mix well. 4.The batter should be a little foamy at this point. Add the potatoes to the batter until they are all coated.